Objective: Infertility is considered as one of the major issues around the world. All the researches in this regard focus on how to enhance successful methods of turning infertile couples into fertile ones. Endometrial mechanical injury in order to augment the probability of implantation of embryo and pregnancy rate has been particularly noted in recent years. 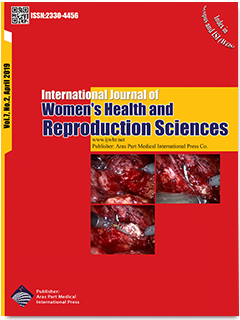 Considering the controversies in the methods and results of the prior researches, we decided to compare the pregnancy and abortion rates in the IUI cycles with and without intervention, by employing a new method. Materials and Methods: This study was performed on 150 infertile couples, which were referred to the Infertility Treatment Clinic of Al-Zahra Hospital (from April 2016 to March 2017) and were randomly divided into two groups. The IUI procedure was carried out in the first group after the endometrial scratch in first to fifth days of menstrual cycle, while the control group underwent only IUI without any intervention. The results of pregnancy and abortion rates, were compared in study groups. Results: Pregnancy rate in the first group receiving intervention was significantly outnumbered the control group. No relationship was observed between the abortion rate and intervention. There was no statistically significant difference between type of infertility, maternal age and BMI, duration of infertility, number of dominant follicles and pregnancy or abortion rates. Conclusion: The endometrial scratch technique, with lower costs in comparison to other fertilization methods, in the first to fifth days of menstrual cycle, preceding IUI procedure, leads to significant increase in pregnancy rate.